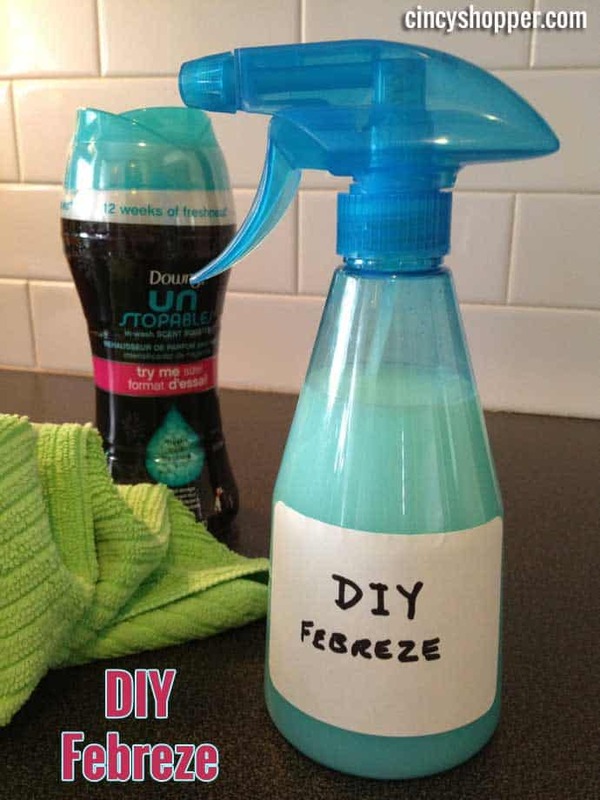 DIY Febreze With No Fabric Softener. Our home has been one that consumes bottles and bottles of Febreze Fabric Enhancer, ha ha! Febreze seems to be one of those items even when using a coupon it is still outrageously expensive. I seen some tips online on how to use Fabric Softener to create DIY Febreze at home. After reading the comments and seeing a trend, I decide to not use the Fabric softener route as it seems to leave a residue behind. A few weeks back, I received in a trial of the Febreze Unstopables Fresh Scent. The thought immediately popped into mind at giving these a try in making some Homemade Febreze. I had some who had been sick recently and was going to need to purchase more Febreze as they had my carpets smelling quite stinky ha ha. So, I whipped up this quick and easy batch of DIY Febreze without Fabric Softener. Made with quick handy ingredients, and at a fraction of the cost of normal Febreze and I would be a happy camper. In a mixing bowl or measuring cup combine all the ingredients and stir. Allow them to dissolve for 30 minutes, stirring occasionally. After the 30 minutes, your beads and baking soda should be dissolved. 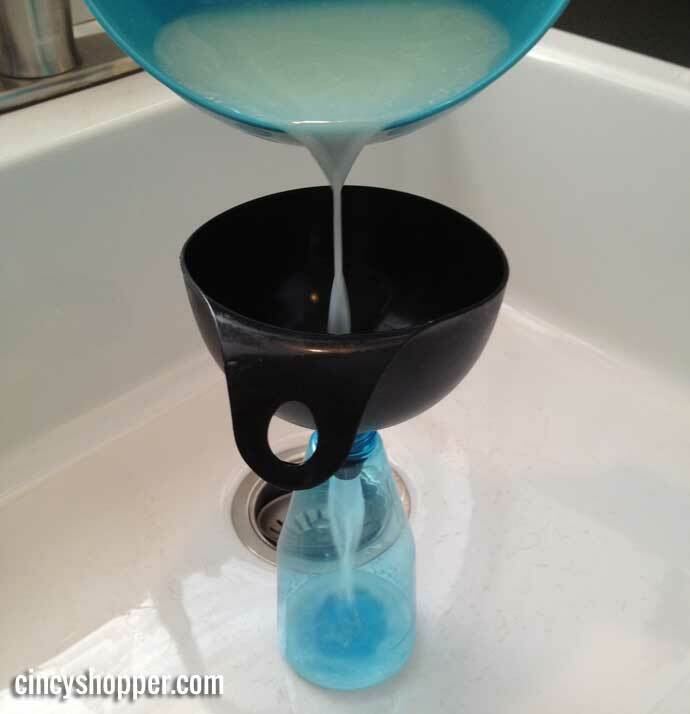 Add your mixture to a spray bottle. My spray bottle is 14 ounces. Then fill the rest of your bottle with water. After spraying my furniture, rugs and drapes last week I noticed that I had no film or residue left behind and it left everything smelling great. I love knowing that I can whip up a fresh batch on the fly. I did notice that I do not have to use quite as much as I did with real febreze. I lightly misted everything one time vs two times with Febreze. So, this will last much longer for sure. This DIY project will save me and I’m glad I decided to give it a try. One container of Unstoppables was sale priced at $4.50 and I used a coupon for additional savings. I figured this one container of DIY Febreze will cost me about $0.60 instead of the high Febreze price. But, I REALLY liked the price of my first bottle FREE. As a stay at home dad I really love this idea.. Thank you! I made up this spray exactly as the recipe says and I am very dissappointed, It left white spots on everything I spreayed it on , they disnt show up until they dried, I nmade my own spray without the Baking soda and it is better !! Me too!! So I made it w/o baking soda!! From my experience, the four tablespoons of baking soda might’ve been waaay too much. It didn’t dissolve – even after two hours – and left white sediment spots on the car interior I sprayed. I even watered it down more hoping to resolve this issue. Didn’t work. :-/ Luckily, the spots brushed out fairly well. Hum? I wondered about that myself. Especially on darker fabrics. I had white residue on my furniture as well. I think I will try to remake it and use less baking soda. Use 2 tablespoons alcohol works better than baking soda and dissolves faster. I MADE IT A WELL AND LOED IT UNTLi SAW ALL THE WHITE BAKING SODA EVERYWHERE. Very same thing happened to me. Then the next day the spray bottle was clogged Had to wipe everything down that I sprayed. May be okay for carpets, but not furniture. Agreed, I had the same problem, even clogged my sprayer. Next time I may try 2 tablespoons. My spray bottle clogged too. Same thing happen to me! What a mess! White spots everywhere! Wish I had read this before I made it. The baking soda did not dissolve. I heated the water again and it still didn’t dissolve. I think I’ll mix another batch using ½ the baking soda and combine the 2 just to see if it’s any better about dissolving. I just tried it. I looked back I have white spots on everything, floor if it hit the wood or walls spots I guess from the soda. Now I have to go clean off everything. All over my wood floors. Everything wood….walls. Does this have too much soda?.. 2 tablespoons alcohol instead of baking sida. Works magic. I’m finding the same thing. There is alot of sediment left in the mixture. The baking soda is still thick at the bottom of the bowl. Smells nice but I will have to leave the bakiing soda at the bottom of the bowl instead of putting it in a spray bottle. What is the baking soda for, i didn’t use it. I ad the same problem. Whatever I sprayed it on had a white haze. I had the same thing happen with the baking soda. Was thinking it should be a teaspoon not tablespoon. I’ll try this! I did try the other method with fabric softener, and the spots were a bit annoying. Why do you need to use the baking soda? I am wondering how safe this is. Unstoppables are flammable. They are designed to be used in the washer and rinsed away before going into the dryer. Wouldn’t spraying this mean it would make your stuff super flammable as well since it is going directly on items without being properly rinsed? Also, I worry about the long term effects of breathing this in. I hope I am not a debbie downer, just was wondering. With the water and baking soda added and the Unstoppables disolved completly, no chance of a fire so good there. I live in South Africa, and we dont have those beads, what can I use instead. Pour each of the ingredients into spray bottle and give it a shake. Or you can use a lavender oil/extract or any other herb such as mint/cinnamon/etc… mix with equal parts of white vinegar and water. Or you can soak a laundry softner/static sheet in equal part vinegar and water overnight and then shake, remove sheet and spray away. use febreze all the time this will save e a bundle. Thanks for t information. I can’t wait to try this. 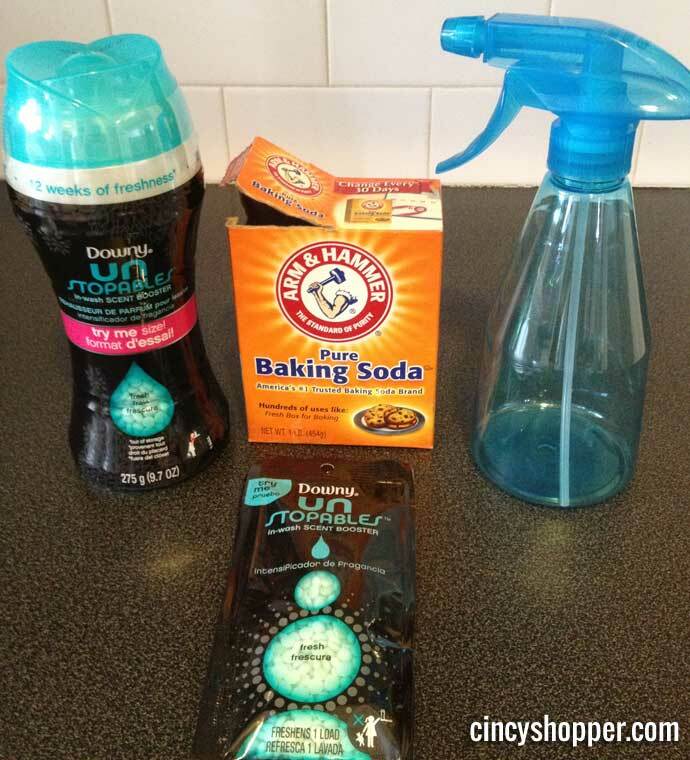 I love DIY home cleansers and air fresheners. Thank you! I have mixed up the ingredients but I have a question. I had already purchased the lavender crystals so I thought I would use those for this awesome idea. But my dlilemma is that the water mixture is a pinkish-purple. Will that stain my carpet????? No way will this dissolve on its own. I put mine in the microwave for 10 minutes then let it cool down and then poured into a spray bottle. Be sure to shake the bottle overtime you spray to mix the ingredients because they settle. I mix it with (cheap) vodka, distilled water and spray wherever necessary. It evaporates fast and leaves a fresh scent. I will try it, I hope it works. The comment I read said it didn’t work so I am Leary of trying it, need more feedback. I’m in Australia, we don’t have Downy Unstopables…is there another product I can use or substitute? Please don’t do this! It’s VERY DANGEROUS!!! It will coat your house in flammable wax and because the substance was not meant to be made airborne and inhaled, the risks of breaking in those substances are unknown. Furthermore, this is an off-label use of the product which voids any possible warranty or protection you may have should your house burn down/ someone gets sick/ etc. Proctor and Gamble specifically states that there may or may not be health hazards directly related to using these as an air freshener when dissolved in water. The wax can coat surfaces and is therefore a risk for dogs and children because they aren’t meant to be ingested and when the wax coats the surface, they may accidentally be ingested. This is a dangerous post, please do further research before recommending things like this. In this case it’s MUCH better to buy the febreeze that smells the same way. Tried it Baking soda didn’t Dissolve and when I poured it in the bottle it clogged up Waste of money! I’m had to giggle just a bit when I read 1/4 cup of beads and 4 Tbs Baking Soda — as 4 Tbs IS 1/4 cup. Sounds worth a try. Whoever wants to try this, please dont. It’s not safe to inhale. The perfumes used in the Downy Unstoppables are toxic when inhaled and are not safe for animals either. You should only use the Unstoppables as directed on the label. Safety is our top priority and all our products are thoroughly evaluated to be safe when used properly. We cannot recommend using a product for a different purpose or in any way other than as explained in the instructions on the label. I tried it I could not get to come out of the bottle. I even put it in just with water. clogged the sprayer up. can you tell me why it needs baking soda in it, can you not just dissolve the beads in water? Hi does it have to be that Thick mixture of baking soad ? or I can evn go doen to 2 or 3 tbsp onlt. reply please and thanks. I don’t know which article you read Kris, but I read 2 and 1 said to use boiling water and the other said to use HOT water, just in case you might have used hot tap water, instead of boiling water, the beads probably wouldn’t desolve. This hack is no good as it does leave residue, also Had trouble with the spay as it seamed too thick.I tried several spray bottles. This smells great. It does leave a residue on my leather sofa though. I suspect it was the baking soda because a damp sponge did get it off. Just wanted to clarify that. Adding more water & it was still too much. Left a gritty texture on everything. WHAT IS THE BAKING SODA USED FOR? The baking soda is a natural odor eliminator. People have used an open box of baking soda in the fridge to absorb fowl odors for years. 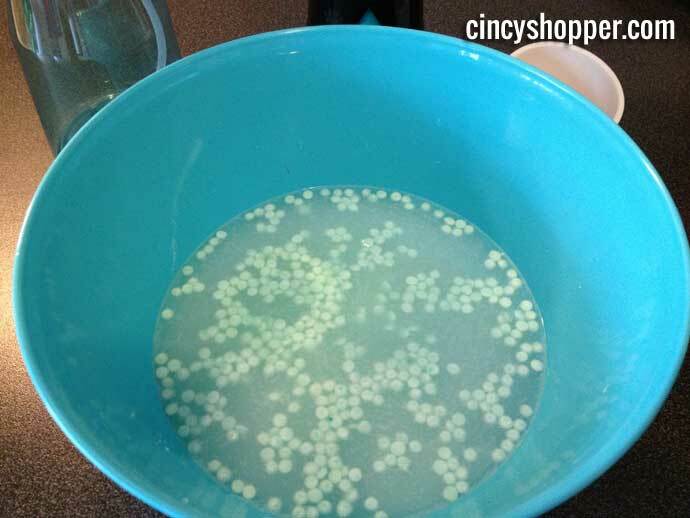 The idea behind this fabric refresher recipe is the baking soda will neutralize odors and the scent of the beads will leave a refreshing scent. I had the same problem.. It left a white spot on everything I sprayed. It smelled great but disappointed in the spot are streaks left behind . What is the purpose of the baking soda? It did not disolve, clogged the spray bottle, and left a white residue. Is the purpose to vacuum and/or wipe down everything after you’ve sprayed? I followed the directions exactly; however, I doubled it since my spray bottle was much larger. After spraying my cushions on some patio furniture, I noticed white spots on everything. I, too, think it may be way too much baking soda. Can the amount of baking soda be reduced? Should the ingredients separate in the bottle after being mixed? tried this and was left with a whit residue every where I used it. I make it without baking soda and there is still little white specks where sprayed. I boiled the water before adding the unstoppables and they dissolved almost immediately. I love the smell but after reading it could be dangerous I had to stop using it. I have a child with asthma so too much of a risk. Needs to be revised. Clogged spray bottle, white baking soda spots all over. Smells divine, though! Will try with less baking soda. my little one peed the bed last night so i had to clean his bed. I used vinegar, gain and water which cleaned it well so it no longer spells like pee but it had some what of a chemical smell to i. So i used this recipe without the baking soda and his bed smells super fresh. BEST idea ever!!! I am wondering if you could add this to plain geletin and make a gel air freshener instead of spraying it. I have been making this for a while now, but we do the hot water, unstoppables beads and 2 caps of rubbing alcohol (to help it dry faster). Never clogs the sprayer, never leaves a residue, always smells super fresh. This recipe does not work. Stops up the bottle every time. My sister and myself both tried it and came to the same conclusion. Why wouldn’t this work with scent oils? A couple of drops would more then likely do it. WHY NOT PUT THE BEADS IN A CANDLE WARMER AND LET THE SCENT GO THROUGH THE HOUSE? I tried your recipe and like it however I have found that the baking soda leaves white spots on the areas where I sprayed. I love this stuff… Used 1 TB baking soda, 1 cup boiling water, 1/4 cup Unstopables, and stirred in 1 cup rubbing alcohol for faster evaporation when using. No spots. It works great! The baking soda clogs the spray bottle and leaves a white film on everything. I just use the beads and hot water. Works great! I make this as well but without the baking soda. Didn’t really see a need for it and figured it would leave a residue. Let me tell ya, this works a lot better than febreze! I read the comments first and used alcohol instead of baking soda – works fine and smells great – I have SIX large dogs so you can imagine if it works for me it will definitely work for a “normal” household! I’ve been making homemade fabric spray for about 10 years now. I always use a few drops (6 max) of essential oil mixed with about 2 cups of hot water. It works wonders and doesn’t leave any stains or residue on the micro-suede furniture that I have in my living room. I do suggest doing a test spray in an inconspicuous spot first, like maybe the side or bottom of as cushion? Using EO eliminates the worries of using a harsh chemical. I used this without the baking soda and it worked perfectly. No white spots or residue. The baking soda is the actual odor eliminator here. In my experience, whenever I’ve needed to get a smell out of something that can’t be washed, I’ve sprayed it with febreeze, sprinkled with baking soda, let it sit a while, then vacuum. Of course this only works on things like your mattress or a rug, because it will probably leave a residue on anything dark. Everyone here asking “why the baking soda?” Probably haven’t done much research about eliminating odors. The reason for white residue is this particular “recipe” calls for way too much baking soda. The baking soda is actually what eliminates the oder, however 1 to 1.5 tablespoons is all that’s needed. A great alternative is vinegar. I personally use Downy liquid softner or a few drops of essential oils. Also to remove lingering orders in the air, place bowls of vinegar in the room overnight. A few drops of fragrance can be added also. It really works.